The Dunraven, a steam and sail-powered vessel used to transport spices and timber, ran aground the reef Shaab Mahmoud in April 1876 during a voyage from Bombay to Newcastle and sank quickly. The ship broke in two, and her two halves came to rest on the sea floor. 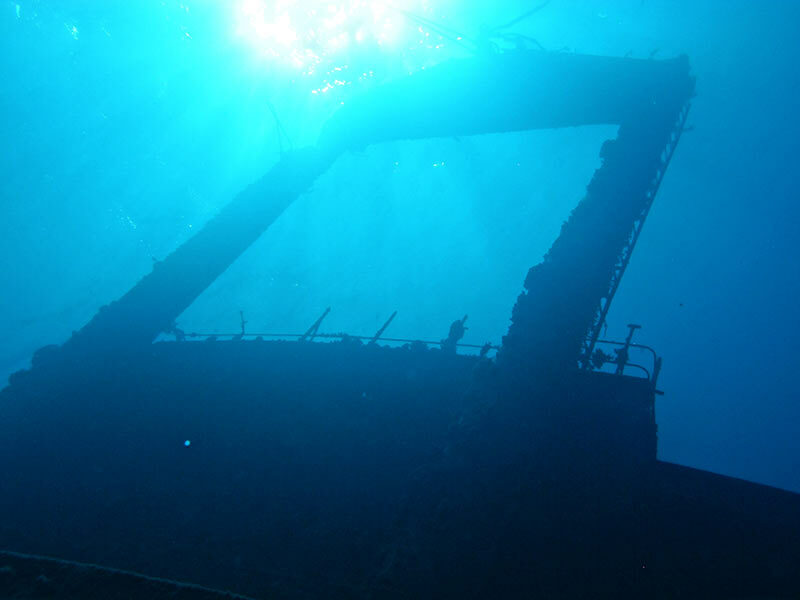 The wreck lies upside down with the stern at a depth of 28 m and the bow at 18 m. At the stern you find the propeller and the rudder, which are overgrown with corals. Inside the wreck you see thousands of glassfish. 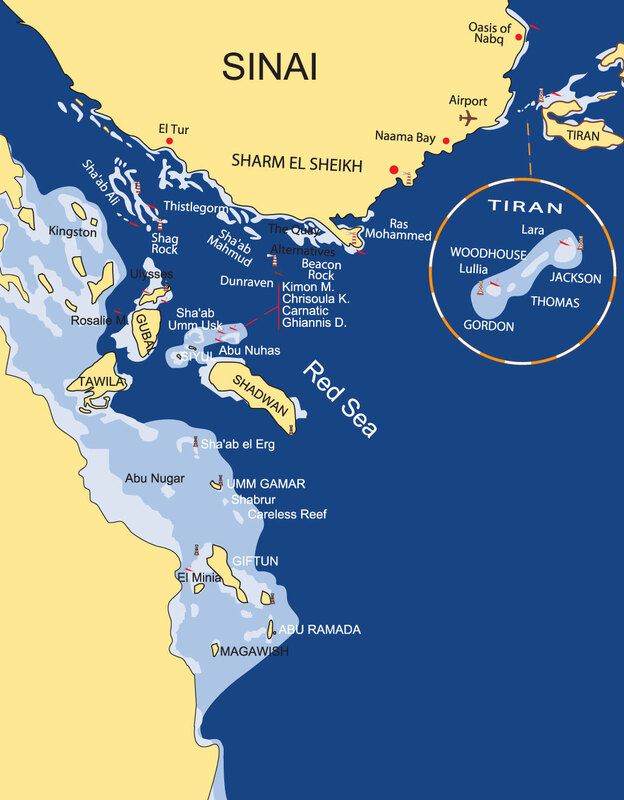 Starting from the North on the Eastern side of the Sinai Peninsula are the Straits of Tiran, also one of the most famous diving areas in the Red Sea. Situated in the middle of the straits are four coral reefs: Gordon, Thomas, Woodhouse and Jackson Reef. The Gordon Reef is marked by the wreck of a large commercial freighter. The reef composition is quite varied, with patchy sections, sand beds and full-fledged coral gardens. In the centre of the reef slope, a shark amphitheater or bowl dips to 24m; with luck a variety of shark species can be seen sleeping on the sandy bottom. The site boasts a very good range of corals, with lots of branching varieties. All of the corals are well preserved, in densely grown patches that often show a remarkable mix of different species. Fish life is not the most profuse in the Straits of Tiran, but there are some notable surprises including a huge moray eel with a body as thick as a small divers waist. Triggerfish abound while surgeons and jacks swim in moderately large schools, and angels, parrotfish and small wrasse are all present in good numbers. Large Napoleons wrasse can often be seen along the reef. The Thomas Reef includes some plateau sections and a very deep canyon running along the reef’s southern section. It is the smallest of the four Tiran reefs. 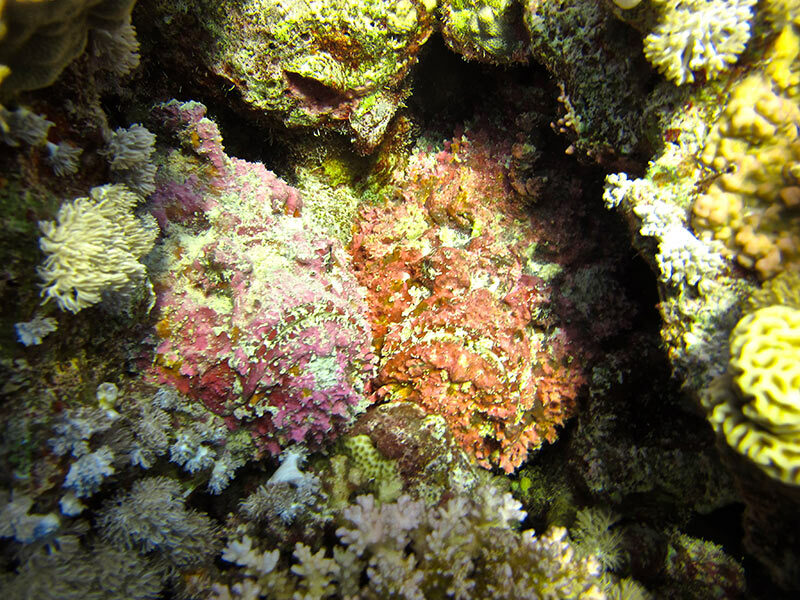 The reef’s upper section is a riot of color, encompassing some of the finest soft coral growth in the Sinai region. Huge, densley packed fields of Dendronephthya of every imaginable hue are spread across the reef, along with antler corals, fine Stylophora, some Acropora and many other stony coral forms. 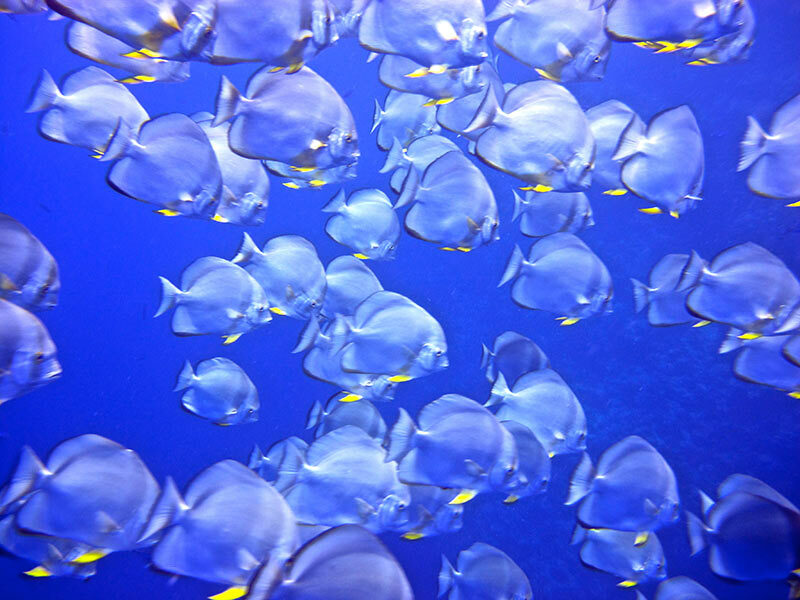 Fish live is also rich, with the greatest concentration in the shallows. Lyretail cod and other groupers grow to great size, and many varieties of rabbitfish and wrasse congregate along the reef face, accompanied by box and pufferfish. The only reason to go deeper than 20m at Thomas Reef is to explore the canyon. The Woodhouse Reef is a long, narrow reef running at an angel from northeast to southwest. Woodhouse is generally dived as a drift along the reef’s eastern side. Coral cover is excellent throughout the reef, with dense growth all over; there are a few sandy patches at depths of around 20m. Many species are present but because of the sheltered position of the reef, away from the main current, a certain amount of sedimentation has affected the corals here. Pelagic fish including big tuna and schools of jacks, fusilieres, snapper, surgeons and unicorns also school here, along with thousands of other reef fish. On the northern edge of the Jackson Reef, the wreck of a grounded freighter stands as a warning to the shipping in the busy straits; most of its hull has been salvaged for scrap, leaving only a skeletal hulk. The steep-sided walls of Jackson Reef are among the finest in the Sinai region; the current-swept reef is densely grown with a real profusion of hard and soft corals, with special accents provided by luxuriant gorgonian fans, sea whips and black corals, and vivid growths of soft coral. Fish life, not surprisingly, is excellent. The strong current brings plenty of nutrients for reef and schooling fish; current and profile combine to tempt pelagic fish in from the open water, and large schools of barracuda and jacks are common here, as are larger predators including several species of shark. The smaller reef species on which these pelagic visitors feed are profuse.